Beltsville Small White Turkeys are relatively small and have completely white plumage. They were developed at the USDA's Beltsville Agricultural Research Center. In the early 1930s most turkeys raised in the US had dark colored plumage, were medium to large in size and had a narrow breast without a lot of meat. In 1936 a survey found that 87% of home consumers wanted a New York-dressed bird (blood and feathers removed) weighing between 8 and 15 pounds. They also wanted a bird that was meaty, well-finished, and had no dark pin feathers. The U.S. Department of Agriculture research center at Beltsville, Maryland, therefore, began a breeding program between 1934 and 1941 to create a bird that would fill the consumer demand for a bird that would fit apartment sized refrigerators, small ovens, and small families. Researchers developed the new Beltsville Small White variety from White Holland, White Austrian, Narragansett, Bronze, and Wild Turkeys. While Beltsville Small White Turkey was successful with small families, it was never popular with restaurants. 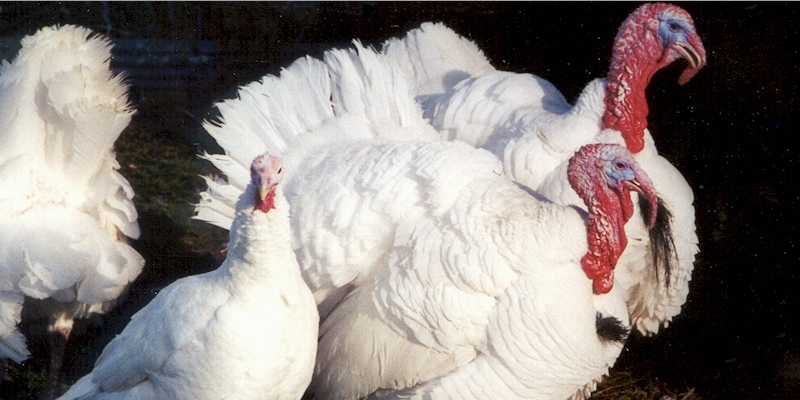 By the 1970s, Beltsville Small White Turkeys had almost disappeared, and the Broad Breasted Whitehad become the most popular. Beltsville Small White Turkeys are still extremely rare today, and are listed as Critical by the American Livestock Breeds Conservancy.